Where can Metadata be Viewed in PublishPress? Each Metadata field can be set to “Hidden” or “Visible”. 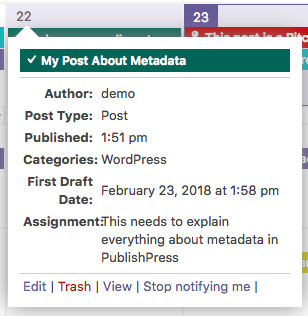 If you set a metadata field to “Viewable”, it can also be viewed in the WordPress admin and displayed on the Calendar screen, the Content Overview screen, and the default “Posts” screen in WordPress.